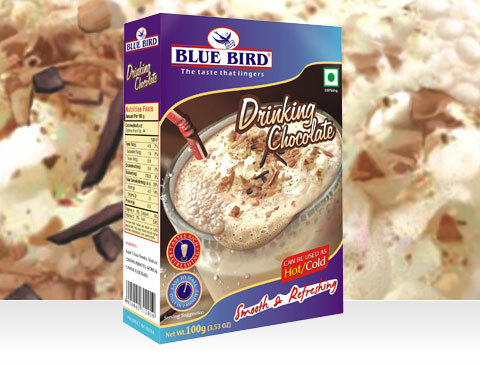 BLUE BIRD Drinking Chocolate is a harmonious blend of ingredients producing a pleasant beverage enjoyed by all ages. Served hot or cold without the addition of sugar this drink can be had as it is or combined with ice-cream. Mix 3 teaspoonful of BLUE BIRD Drinking Chocolate with 1/4th cup of boiling water in a glass. Now pour chilled milk into the glass stirring all the time. Your glass of refreshing drink is ready. Prepare the cold chocolate drink as given on the above (step 1 & 2), add 2 tsp.ful of BLUE BIRD Whipped Cream powder and whip for 1 minute with an electric whipper. Serve in a glass with garnishing. Stir 3 teaspoonful of BLUE BIRD Drinking Chocolate into a mug of hot milk. Now your mug of rich and healthy drink is ready to sip.